At least 46 adults and children were injured this morning when a loaded gravel truck struck a Milwaukee Road "special baseball train" at Duplainville. Glen Haggith Photos, except as noted. It was impossible to obtain a list of the injured or the extent of their injuries at 2pm., 2 1/2 hours after the crash occurred. 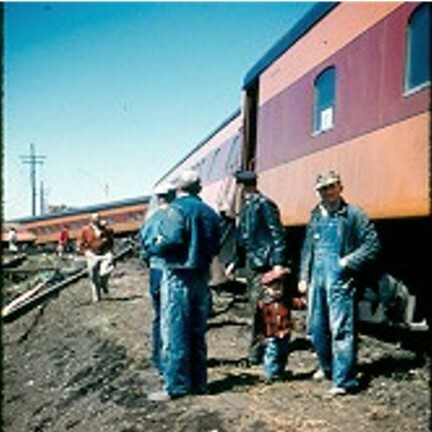 The train contained about 860 children from Columbia and Marquette counties on their annual trip to see the Milwaukee Braves and Brooklyn Dodgers play this afternoon at the Milwaukee County Stadium. The children were 7th and 8th graders. Clifford Barnard, Columbia County school superintendent, was in charge of the group. According to eyewitnesses, the truck driven by Gordon Hinkley, about 41, of Wales, Wisconsin, was traveling south on Hwy 164 ( Duplainville Road ). It went thru the wig-wag signals at the Duplainville crossing and struck the train. W.S. 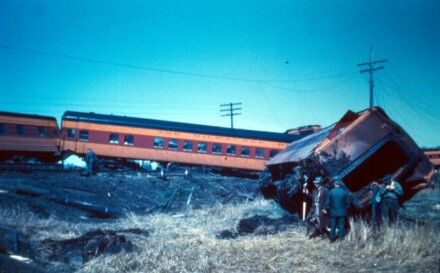 Pirkl, LaCrosse, traveling engineer in the train cab, told a Freeman reporter: " I saw the truck coming at full speed. I thought the truck would either get us or we'd get him". 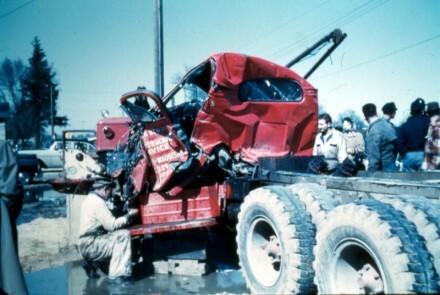 "The truck hit in the middle of the front car behind the engine. 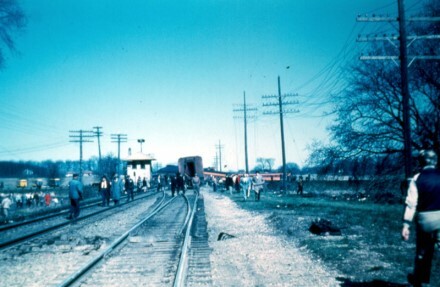 The air brakes went off and knocked the first car off the tracks." 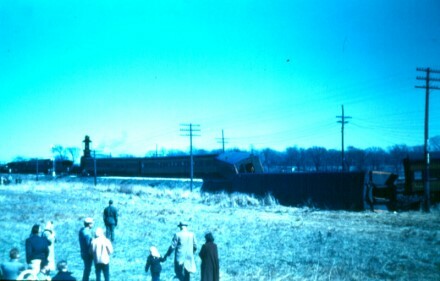 The 16 car train was traveling about 65-70 mph. Pirkl said the Duplainville crossing is a 70 mph crossing. The terrific impact disconnected the diesel engine from the rest of the cars. 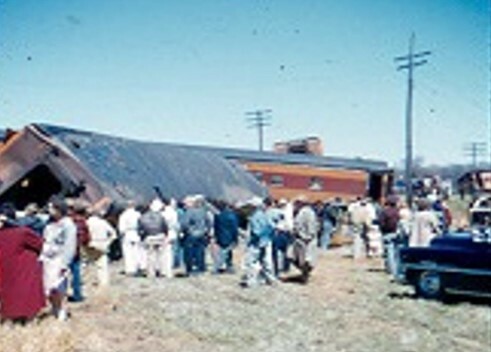 Ten of the 16 cars were derailed, all of them toward the front. 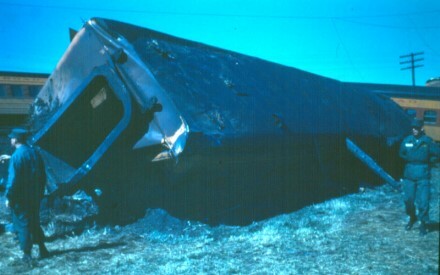 Seven of the 10 tipped over, partially or wholly, on their sides. The engine remained upright. The impact carried parts of the truck at least 100 feet eastward along the tracks. The tracks were torn up and twisted like pretzels. 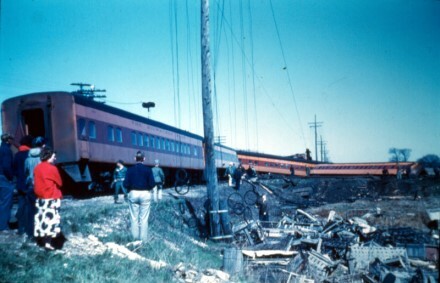 Severe damage was done to the tracks when the derailed cars struck the Soo Line tracks which cross the Milwaukee Road Tracks east of Highway 164. About 2000' of the track was torn up. It was also reported that the SW corner of the Duplainville Tower building was damaged. Latest word from the hospital was that Hinkley suffered compound fractures of the right leg and other injuries. He was receiving blood transfusions and was in critical condition, a hospital spokesman said. First reports said most of the injured were in the 4th car behind the engine. The car was filled with children from Westfield in Marquette County. Three people were trapped in one car. They were extricated by Sheriff Mike Lombardi, Tom Nettesheim, Lloyd Tegge of Waukesha and Deputy Charlie Race. Reporters and other observers at the scene saw no dead. Freeman reporters said many people were lying on tarps spread on a farm field next to the train tracks. "Those who weren't hurt badly appeared dazed," one observer said. Others went around comforting those who were hurt. Cries of the injured children could be heard. The area soon filled with deputies, policemen, ambulance drivers, doctors, firemen ( 5 fire departments responded to calls) and citizens who wanted to help. There were no reports of fire. Twelve of the 16 cars were made up in Portage, three in Rio and one in Columbus. 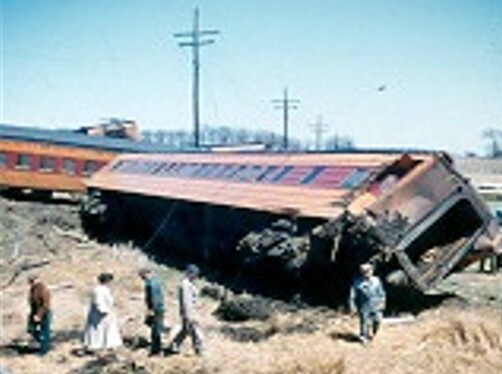 The train reportedly left Portage about 10am. 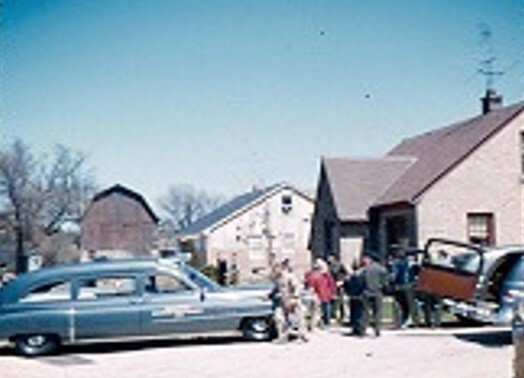 The children were from both public and parochial schools. There was an average of 60 passengers in each of the cars, it was reported. 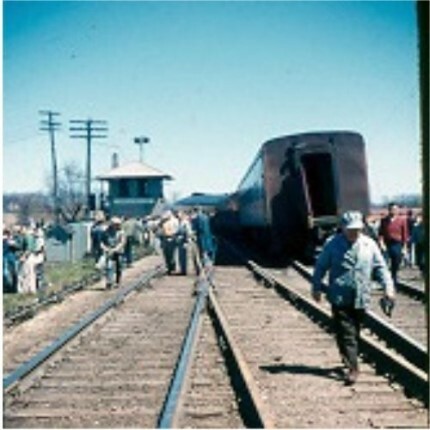 Plans were to uncouple the upright passenger cars and pull them back to Portage, if possible. 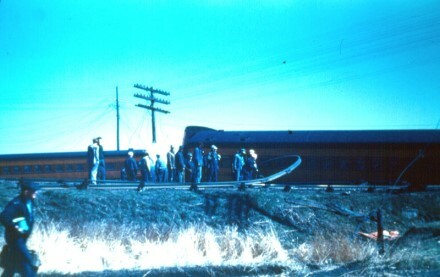 Highway 164 was blocked to traffic at the train crossing. Five Pewaukee buses were used to transport those not seriously injured to the hospital for first aid. One deputy said most of the injured children suffered cuts, wrenched backs and bruises. Train conductor Otto Dengel of Oconomowc said, "Everything was going lovely. Then it happened--so fast. It took only about 5 seconds and everything was over." Ralph Becker, Portage trainman who was in the last car said, "We hit the brakes and I knew we hit something." 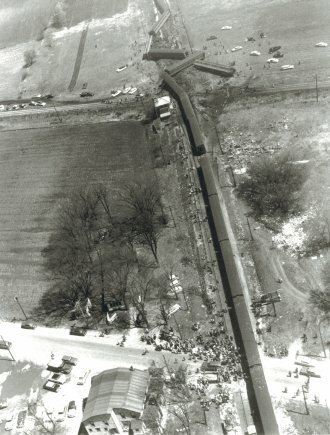 Jack Clarey, a Sussex eyewitness, said the train signals were operating before the accident but the truck did not stop. Glenn Collins, Westfield, principal of the grade school at Montello, was playing cribbage in the front car when it happened. " It all happened so quickly. Glass was flying all over." He suffered a leg injury. His card partner, Roger Constance of Montello, suffered cuts. Reports were that it took almost a half an hour to extricate the truck driver from the cab of the truck. The truck was reportedly is owned by John Dewar, Highway 18, Waukesha. Now that's a real ambulance!